Beautiful 4 Bedroom home with an excellent location in the highly desirable historic Pierce Downer neighborhood. Picturesque street close to Prince Pond and Park. Walking Distance to all 3 schools, the Village Center & the Main Street METRA Station, which offers non-stop express service to Chicago. Large two story foyer. Open Floor plan for entertaining. Warm and inviting sun splashed rooms. Hardwood Floors. The kitchen has an island and pantry and is open to the Family Room & Fireplace. Double doors in the Family Room open to a charming backyard entertaining area with a brick paver patio. Formal DR. Very spacious Master Suite with a vaulted ceiling and Master Bath featuring a bath tub and separate shower. First Floor Laundry/Mud Room. Finished Basement with guest bedroom and full bath. Attached 2 car garage. A rare chance to live on such a peaceful and tranquil block, steps away from the center of town. This home has so much to offer. Experience how delightful this home is! Just completed in January of 2017, this gorgeous home is ready for your family! Cul de Sac location steps away from Waterfall Glen Forest Preserve with top rated schools: Darien elementary and Hinsdale South High School. Brick on all four sides of the home with cement board siding on upper story. Large kitchen with island and pantry. Gas range, built in Microwave with exhaust vented outside. Master bedroom opens up to a balcony, private bath, two walk in closets and bonus room. Oak hardwood flooring on both the main and second floors. Dramatic, decorative staircase. Laundry on main level. 9 foot ceilings, stone fireplace, granite counter tops, stainless steel appliances and finished 3 car garage with 7 foot doors. Spacious full lookout basement has 12 windows and rough in plumbing for a future bath. Additional square footage can be made by finishing the basement. Fully sodded front and back yard. Builder is a joy to work with and deals directly with you to meet your housing needs. Custom brick ranch home built by Sievers in 1981. Hardwood Floors, Crown molding. generous room sizes. Kitchen redone in 2016 with custom cabinets, granite counters and stainless steel Kitchen Aid appliances. First Floor Family Room with Fireplace. Baths updated in 2009. Master bath with large shower. Pocket doors and wide doorways make this home accessible. Huge Laundry/Mud room off the garage. Full unfinished basement. Brick Paver Patio. 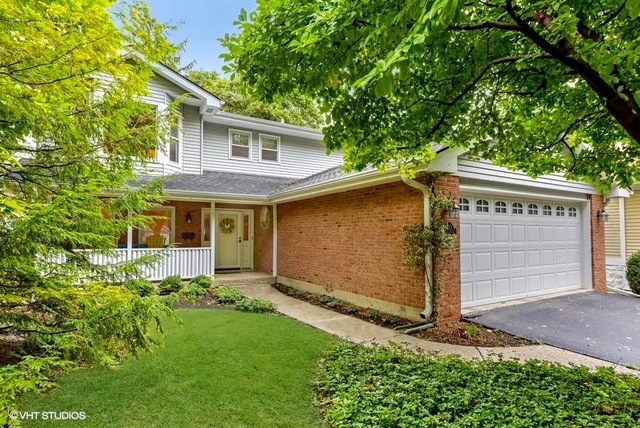 Wonderful in town location in North West Downers Grove! Vacation at home when you live in this lovely two story with 70 feet of frontage on a 15 Acre Lake! Large windows maximize water views! Large Family Room with Vaulted ceiling, wet bar and gas fireplace. Extra large patio doors lead out to the brick patio. Updated Kitchen with Natural Cherry Cabinets and Granite Counters! Large First Floor Laundry/Mud Room. All baths have recently been updated. Finished Basement with Rec Room and large Utility room with a pet shower. Lake Charles is stocked for fishing and acomodates non motorized boats. This is your private retreat! Exceptional Family home located on a quiet cul de sac in North Downers Grove! Gracious rooms with nice flow. Sunny Kitchen features white cabinets, Stainless Steel Appliances and Quartz Counter Tops! Large Breakfast Room. Inviting Family Room off the Kitchen with Wood Burning Fireplace and Hunter Douglas remote controlled window treatment. First Floor Laundry/Mud Room with an exterior door. Three Season Sunroom with Vaulted Ceiling for Summertime Entertaining and Family Fun! Huge Master Suite with Updated Bath has a Travertine Marble Shower. Large Bedrooms, 3 with Walk in Closets. Private, professionally landscaped back yard backs up to wooded land belonging to School district 58. Gate in back yard allows access to the sidewalk leading to Belle Aire Elementary School. You can walk to school without crossing any streets. Roof replaced in 2013. Highly rated North Downers Grove Schools! Convenient location! Lovely Orchard Brook Two Story. Generous Room Sizes. Living Room with Bay Window. Remodeled Kitchen with Maple Cabinets, Pantry and Granite Counters. Kitchen Aid Appliances. Hardwood Floors and can lighting in the Kitchen. Family Room With Fireplace. Windows have been replaced. Large Master Bedroom with two closets. Remodeled Master Bath with Large Shower. Brick Patio, Large, Level Back Yard with Storage Shed. 4 Zone Irrigation System in Flower Beds. Finished Basement with Rec Room, Office, Utility Room and Cement Crawlspace. Furnace and Central Air Replaced in 2013. Roof 2010. Yearly Assessment for Orchard Brook Pool and Clubhouse. Walking distance to Belle Aire Elementary School. This Gorgeous Scottsdale Ranch has it all! Gracious Rooms with Vaulted Ceilings, Family Room with Fireplace that is open to the Kitchen Dining Area. Spacious Kitchen has 42 inch cabinets, granite counters, Stainless Steel Appliances including double ovens and a gas cook top, a Skylight and loads of counter space! Choice of Breakfast Bar or Breakfast Room which leads out to the stamped concrete patio. Master Suite with Walk in Closet, Vaulted Ceiling, Fantasy Bath with whirlpool Tub, separate Shower and Skylight! Hall bath has a Solar Tube for added light. First Floor Laundry. Extra Large Basement (1864 sq. feet) is finished with a Rec Room, Game Room, Wet Bar, Bedroom and Full Bath! Concrete crawlspace provides ample storage. Sump has a water powered back up pump. 3 Car Garage. Large concrete driveway. Professional landscaping, in ground sprinkler system. Just move in and enjoy!